Slowly, slowly, while chatting to the ladies on Monday, I made some progress. It was a welcome break in what is proving to be a mad beginning of academic term. I feel like singing “I’m still standing, yeah yeah yeah…” as my fellow professors all disappear. One to become Dean, one on sabbatical, one to a horrid ski accident last weekend. Still standing? Just about… At least a measure of sanity is conserved through thinking about something completely different, like slowly slowly piecing fabric together by hand — in this case using recycled sheets. Then, in a stolen hour, I went back to my charity-shop wool coat, armed with a bundle of exciting metallic threads Ms E leant me. Turns out that my machine, while charmingly German and all, really is totally picky about what sort of thread it plays with. In the end, I managed to use some in the thread bobbin (but then try adding those while stitching blind upside down…), but then I got hopelessly frustrated. I returned to my golden thread, with a ‘topstitch’ needle, and super low tension. That seemed to help. As my lovely friend Ms E ever-so-tactfully commented that the jacket currently draws attention to the widest part of my backside, I am now focussing on taking the decorations northwards! True friends will tell you such things kindly! 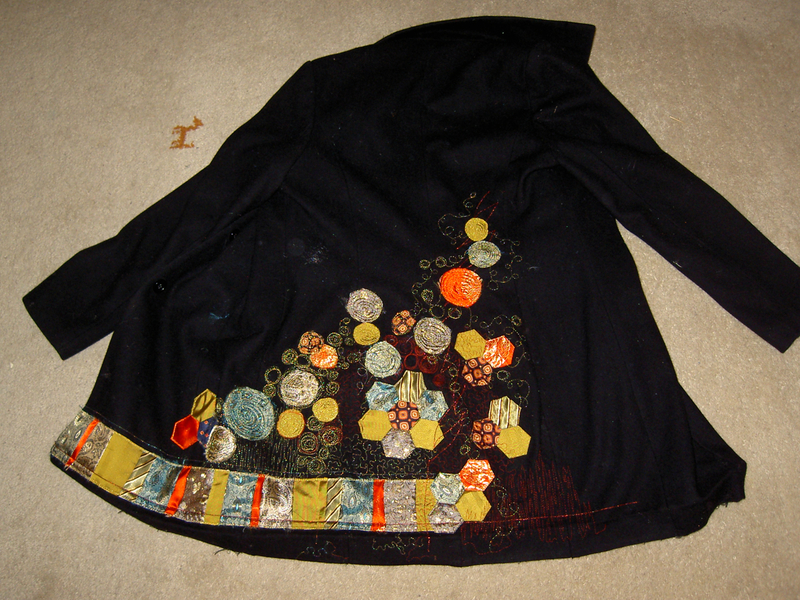 Circles are now slowly climbing up my back… Anyone have tips for sewing with metallic threads? I’m willing to try anything to be able to play with the bag of goodies I have, including some gorgeous variegated greeny-redy one. 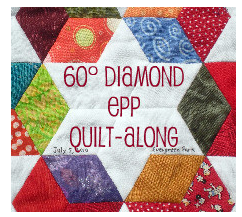 Linking up to the weekly Life Under Quilts linky party, and Work in Progress Wednesday… Then I can go and visit a whole lot of other people’s project, get happily sucked into Blogland, and emerge refreshed… but having not stitched at all. Oh well. Fun too! Incidentally, Ms E has two unexpected cancellations on her hugely successful Alpine quilting retreat that has been booked up for months, so snap them up for 24-27 April 2014. You’ll meet the most wonderful bunch of people at Patchwork in the Peaks, faithful and new — and all incredibly welcoming! For the first time ever since these started, I cannot go. I am gutted. 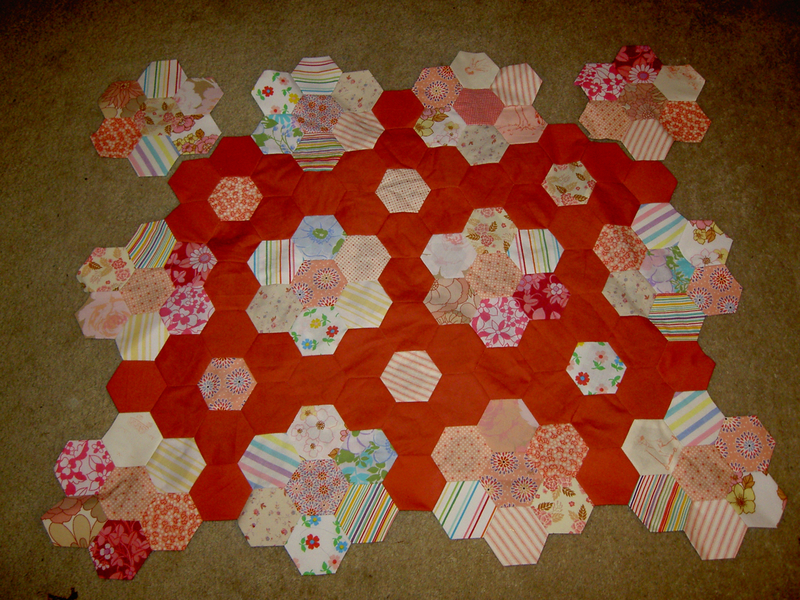 I love your hexies, those colours are great and recycled sheets are one of my favourite things to use in quilts. Is it going to be a large quilt or a smaller hanging of some kind? Your coat is looking gorgeous too. I once used quite a bit of metallic thread in an applique project and I remember it was a pain in the backside to use, but I think I found it slightly easier when I had just a neutral cotton thread in the bobbin with it, but that doesn’t sound like it’s your experience? I think I would have been tempted to hand blanket stitch wool ‘pennies’ or hexies on with the metallic thread if it’s a wool coat, but you’re probably too far down the road to switch to something like that, and your design does look completely amazing, seems like you’re just going to have to perservere with that pesky thread in the machine! It’ll be worth it in the end, good luck, and sorry this is such a long comment! The coat is gorgeous! How creative you are! can I borrow your coat when it is done? love it! Ooh, love your coat! Sorry to hear of your work troubles! I had to laugh about being sucked into blogland! !